This year has been filled with mixed emotions for many of us. The poor economy has really brought a sense of reality to many of us this past year. As I look back I see many great things too and today is the time to remember them. If life has shown me anything, everything is relative, and you can always find the bright side if you look hard enough. For me the bright side has been how much closer I feel today to many old and new friends that I have connected with through places like Facebook and Twitter. The world has become smaller and I love the ability to connect with these friends. I am so thankful for my supportive family that has put up with me traveling and spending way too much time on the computer. I am also thankful for all the supportive people that I have had the opportunity to work with, including the Customers that make my job even possible. My team has been extremely incredible at creating a new way of interacting and learning from Customers, I love the opportunity to work with them every day. I am still in shock over some of the attention we have received, and we will do everything we can to live up to our Customers who bestowed that one us. I look forward to furthering the cause of Customers to all companies I interact with. I want to wish all you and your families and incredible Thanksgiving! Today is a day to spend with family and friends and celebrate all we have to be thankful for. Brian Solis always has thought provoking posts, and today “The Twitter Star: Nova or SuperNova” was no different. It really provoked some thoughts from me regarding Twitter. In the post Brian points out some of the declines in visitors to Twitter.com over the past 3 months. He also points to an April study by Nielsen Online that shows 60 percent of new users do not return. I know many will point out that these measures do not include all the Twitter tools and the open API, and I will concede this point. Of course Nielsen did not concede that point and in this post they took the study a step further and proved the decline, even when you consider applications. Over the past few months I have noticed less conversations and a lot more noise which makes it very difficult for new users, and I am sure frustrating to users that have been in the space for a long time. Twitter has been making strides to make things easier, including creating lists which make it easier to follow people that are important to you. They also make a great entry point for people to start following groups of people. Many users have been doing this via tools like peoplebrowsr for a long time. It is great that Twitter is catching up, but is it enough? Just take a moment and see that you can make money with this. A lot of people are doing it now. I have said for a long time this is a community, and in many ways the community must define what the future of Twitter looks like. If we want it to be relevant long into the future, what would you do? Have you noticed a change in Twitter? Sometimes people will challenge the thought of Customer Service in social media. The belief is if Customer Service was excellent there would be no need for Customer Service involvement in social media. I think these beliefs are shortsighted, but for a few different reasons. Let me start off with stating that I believe Customer Service must improve for all companies, and a big cause is social media. The Customer is gaining the upper hand, and I think that is great. As a Customer Service person I love that this is becoming more of a focus for companies and their Customers. Blogs, You Tube, Live Journal, Facebook pages (not status updates) â€“ These spaces, and others like it, are Customers stories of things that already happened. Great way to learn from Customer from the good to the bad and even the ugly. Twitter, Facebook status updates (when made public) and other microblogs â€“ These are great spaces to learn things before any other means of communication. On Twitter people are answering â€œWhats Happening? The answer may be I am calling XYZ company becauseâ€¦ So now you know reason for the call before they even connect to an agent. This information in a centralized space can add tremendous value because as a business leader I can know more before things are identified through calls or other forms of contact. This can save companies tremendous money and provide great cost savings leading to a better experience because sometime we can even use Twitter to find the answer and supply to agents before the call came in. I can see tremendous value for all interactions by listening in every one of these spaces. Using the crowd sourced information, such as what can be found in forums, will lead to cost benefits and a great way to engage your most passionate Customers. In many businesses, such as the cable industry, so many variable impact performance and technical forums can help find solutions to the most difficult of problems. So if someone is having trouble with XYZ router, the call center may not have the answer since it is impossible to know every router ever created, but the answer may be quickly found in a forum. It is crowd sourcing at its best. Now that can lead to huge cost benefits! The other notion that is implied in many of these conversations is excellent service will lead to positive information in social media. This is incorrect. There are a number of companies that I follow because of how much I love the service they provide to their Customers. These companies encounter many negative conversations, in fact I even did a blog post regarding one of them. I still feel guilty, since the vast majority of my interactions with the company were perfect. In the end, I think listening to your Customer anywhere will lead to improved Customer experience and cost benefits for the entire company. Social media is not the holy grail in any way, but it is one piece of a listening strategy. There are great tools that can help you listen to calls, or other communications with Customers. I also recommend providing your Customer an easy way to share their feedback through other channels that may not be as public. It is all part of a cohesive listening plan that, in my opinion, all companies should be looking at. The key is remembering the Customer is part of the solution, and social media is a great way to involve them! I am in Las Vegas right now attenting the WOMMA Summit. Last night I had dinner with a good friend, Pete Blackshaw. Much of the conversation was about a piece that was in USA Today on Wednesday titled “Social Media, like Twitter, Change Customer Service.” Needless to say when I read the opening discussing a missed opportunity for my team I was a little upset. But this really started me thinking about Twitter and businesses that use it. Expectations have been high as this new engagement tool has been developed for businesses. I am proud to be one of the people that have really shown how it can be done. At the same time I think there is a divergence between the expectations and the realities. I have heard businesses and individuals discuss the space as nirvana for communications. I do not believe it has achieved, or will ever achieve that level for anyone. Nirvana is way too high of a threshold for a tool to such as this to achieve. There are faults, like most means of communication, such as a fail whale once in a while (although much improved) or a tweet not coming through to the many tools that use the Twitter API. Besides the technical things that can happen, let’s face facts, we are human and at times we make mistakes. So if this space is not nirvana, what is it and how can companies use it? Well have you ever heard of the theory of Pangaea (sometime spelled Pangea)? This is the theory that at one time all the world’s continents were together as one; the continent of Pangea. Twitter has proven to bring the world together for numerous events around the world, the most discussed probably the protests in Iran. I have always seen the benefit to Twitter as a way of meeting new friends (Facebook being the space for the friends I already know). Through Twitter search we can learn almost anything and connect with people that have the knowledge we are looking for or the thoughts we want to connect with. For businesses, it is not the space to force one sided conversations, as many people have sought. First and foremost it is a space that is worth listening to in an effort to learn and obtain information faster. Search is the key. Through this your organization will transform into a smaller place because you are connected directly to the Customers thoughts. In business it is impossible for every executive to review every interaction, but reviewing 140 characters will provide you the same information in a much easier manner to digest. One of the keys to this is this is not a metric or number, but instead the Customer’s view in their own words. Nothing is more powerful than that. It can also be used to have actual dialogue with your Customers allowing them to be part of business solutions. Customers and employees of all levels have wanted a say in business operations for years, but there were no easy ways to do this, and in many cases it was not welcomed by individual leaders. The dictator style of leadership. Well social media has killed that syle and today it is involving others. It is a great way to do it because it creates immediate buy in. Those involved also have a vested interest in success. Twiter is an easy tool to involve your Customers. As you build a following, you can ask questions, even provide business problems and the crowd will help provide answers. This to me is probably the most enjoyable aspect to Twitter. I know some will say not every Customer is on Twitter, and that is a fair statement. At the same time there is no cost effective means to do this like in the same manner to all Customers. Twitter is bringing the world together, even in business. Embrace this fact and strive to do the right things and your business will be successful. Business Has Always Been About Personal Connections! So I just got home from the New Tee Vee Live conference in San Francisco. I had a great time meeting friends that I have spoken with many times via Twitter. This was not my typical conference, since normally I have the opportunity to go to conferences more centered on social media or Customer service. I did not have the opportunity to stay in San Francisco long (just about 30 hours), but even though it was quick I did leave with a reinvigorated spirit and deeper friendships. One of those friendships is with Om Malik, who I found to be simply a nice guy. It is funny, because I have seen the fear he can instill in so many people based on his frank and honest writing style. Instead I found a honest, quiet man that is open to laughing at himself. I enjoyed the dinner the evening before the event. At dinners like this there is always a few speeches and toasts, this was no different. When Om Malik got up he thanked many that contribute to the success at night. Among those that he acknowledged were many members from Comcast, my employer and the main sponsor for the event. In his acknowledgement he went a step further to discuss the great connections he was making with the Comcast team members that were there. I am not sure what he was expecting, but you can tell there was a genuine like on both sides. This was not a surprise, because I know I work with a lot of great people. I was not surprised at the public acknowledgements; let’s face it, that is the nature of these type of events. What did surprise me was the deeper personal conversations I had with Om and members of his team at Gigaom.com. These included advice and honest conversations that were very touching. This was the personal connection that really mattered. While I was at the event , CBS News played a piece based on an interview we did months ago (A copy of the story is below this post). The piece was regarding the trouble companies have allowing there employees to use social media while at work. To me, as I pointed out in my last post, it is similar to the debate I am sure happened when phones came into the office setting and I know the same exact debate happened when employees were provided access to email. One of my friends, Beth Harte, likes to share a picture of a golfer when she discusses social media with senior executives. She is making the point that social media is the new golf outing to attract clients. I agree in many ways. Of course social media is a little cheaper. For those who point out that social media has a negative impact on productivity, I would ask how long a status update takes on Facebook? How about 140 characters on Twitter? Another question I would ask companies is if they expect their employees to answer their blackberry during off hours? I think that is why they provide them in the first place, so why can’t a little bit of home be brought to the office? Seems to me to be double standard. If you are a business, social media is a great way to humanize your brand. The only way to humanize your brand is through your employees. They are the most valuable asset to any company and in many ways actually define your brand. Teach them social media, help them engage in it, and create an environment that encourages it. This has been proven to be successful, just look at Zappos. So whether it is in social media, at a business function, conference, or meeting a Customer at a local store, it is all about building and maintaining relationships. Your employees are the biggest company cheerleaders, so please let them go cheer! I apologize if this post seemed to go in a few directions. While I was writing it I was having a conversation with someone that believes that companies should block social media websites and forbid employees from speaking about the brand. It caused me to go in a little different of a conversation, but, like that individual, there are many people that do not understand the potential positive outcomes by building a social business. Of course the conversation with that person was on Twitter! Some do not see the benefits in gaining Customers, or how this new communication can really help businesses find new solutions and answers. The social web has a lot of potential if a company decides to fully tap into it. The Social Media Fire, Will It Change Corporate Culture? 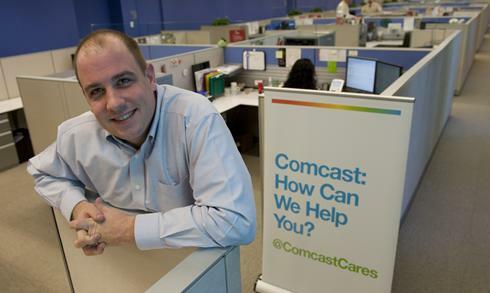 At Comcast, employee Frank Eliason took the initiative last year to use his own Twitter account to contact customers who were tweeting about service problems. Now known as “Famous Frank,” Eliason has been credited with almost single-handedly turning around Comcast’s reputation. He heads a staff of 11 who monitor social networks and offer help to customers. I am sure some will say they have not experienced this fully yet, but I will tell you a lot is being done to ensure you do. You will be cheering! Internally the conversation is always about the Customer experience and how to make sure we get it right. I see a much different place than when I started 2 years ago. I do not believe it was due to me, but a lot of the discussions in various spaces that started to come together at the same time. Many of the discussions supported greater transparency, Customer focus, and an environment that questioned how things were being done. As this took shape, the culture of the company changed. Social media is about relationships, and ultimately relationships are good for businesses and employees. Will social media change corporate culture? Well have other forms of communication? I believe phone, email and the internet have already changed the culture for everyone, especially businesses. With each new form of communication we gain efficiency and we find new ways to speak with Customers. Can you imagine someone typing and copying memos? Ugh, I would hate that. For those that say Twitter and Facebook take away from the efficiency of the workers, the same was said about email and internet access. I bet it was also said about phone too (oh no, a family member better not call). Social media has made the world a smaller place (there are numerous examples of this) and I know it can make the business world smaller too.